Method Laundry Detergent is a small bottle with big results! This naturally derived Laundry Detergent fights tough dirt and stains with every wash. One capful of this concentrated formula is all you need to tackle large loads. I think it's by far Method detergents best scent! It's neither overpowering nor nonexistent; add to that a great clean using minimal amounts of detergent and you've got a real Winner! This is my favourite laundry detergent. It smells great and works so well. You don't have to use a lot so it lasts a long time. Great product smells wonderful cleans clothes well. My son has allergies to most detergents but he has none to this product. This detergent actually works well and is not too hard on clothes! My son will actually get hives from certain detergents but not this one! I love the smell fresh out of the wash. Ive bought this scent a few times. Im interested to try other scents but Method's scents can be hit or miss and I dont want to be stuck with a scent I dont like. The bottle is very concentrated and lasts a long time. This is my favourite laundry detergent. I love that it's a natural product but it smells nice and works great! This is my favourite laundry detergent! Smells and works great and its all natural. My one daughter is allergic to pork, so must use VEGAN products. This can be challenging but she loves how clean her clothes are AND they smell great. This detergent was just okay for me. It has good cleaning power as expected from Method products; but the scent was disappointing. I had hoped for a more complex floral but this smelled like any regular econo detergent(not particularly pleasing). I much prefer the ginger mango and will return to that fragrance once this bottle is finished. Love the method products and use many of them. This is my favourite scent for the laundry. Although the ginger mango and coconut lime ones are also nice. Cleans well and doesn't dull the colours in clothing. This is my favourite laundry detergent. I love that its non toxic so I feel good about using it for my baby's clothes as well as my own. It works and smells great! I love that I can use this for my baby clothes and know there aren't any harsh chemicals. It also smells great! I love this detergent! Cleans well, smes great and I feel good about using it for my newborn. Cleans well and gives my clothes a lovely lasting scent. Use with the fabric softener. I would definitely recommend. Such a divine scent for laundry, this product makes it feel like a bit less of a chore. Works well even in our very, very hard water-- still gets a good 'lather' going in the washer, but only requires a small amount of product to do so! I pair with the matching fabric softener to extend the life of the scent this imparts on our clothes-- it's really divine. Plus the container itself is easy to handle and hold. This product - along with all the products from Method, is fantastic. The smell is not overwhelming, it is soft and subtle. We have never had a reaction to this product (including my 4 month old daughter). With heavy duty laundries ! Smells great, and great value for the number of loads it is good for. Also love that its hypoallergenic and safe for my baby. This product not only works well but you use very little and it smells lovely. I have 3 messy little boys and a baby girl. Love the clean scent this leaves on all of our clothes. This is now my new go-to detergent!! I only buy household products that are animal cruelty free. 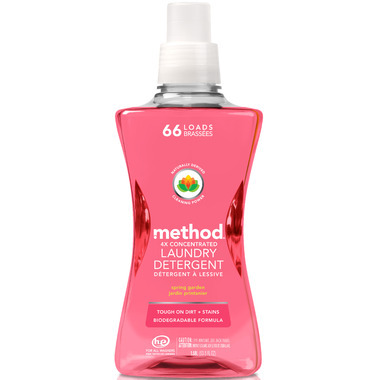 Method is not only that, but this detergent smells GREAT! I think it actually smells better than the 8x concentrated. I'm gonna try them all! Love it so much, I'm gonna buy one for mother-in-law! I like the cleaning power and concentrTed format. Love all of Method's products, but prefer the pump for laundry detergent. This format has all the messy gloopy properties of other liquid laundry packaging. awesome love it! works great smells great!